The prison community is an often forgotten community, considered as something apart or different, with a stigma attached to those inside. Society tends to pass judgment on those who have been incarcerated. But Fresno State students, faculty and staff are connecting through the Insight Garden Program, which builds gardens inside prisons. "The goal of the program is learning to grow yourself as you would grow a garden, learning about building from the soil up, from the roots of ourselves to grow and bloom," said Calliope Correia, manager of the Horticulture Greenhouses and Nursery. "The tangible result is an actual garden inside each prison, a place of nature and flowers and life inside a harsh environment." Most of the participants in the prison are going to be released back into society. Programs like the Insight Garden Program can reduce the chances of recidivism for those who leave prison and return to the outside community. By offering volunteer opportunities to Fresno State students to work with the prison population, bridges can be built toward a stronger community. "The experience has been incredible and has greatly exceeded any expectations I may have had going in," said Calliope. 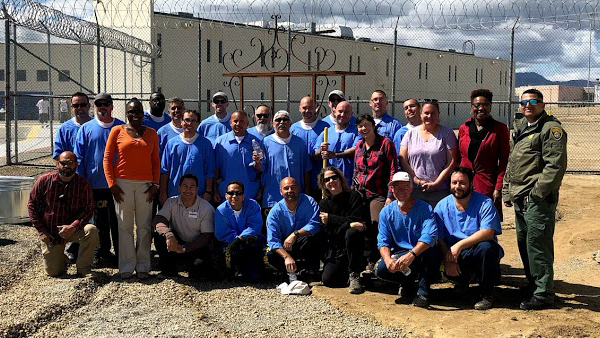 A little over a year ago, IGP received a grant to start programs in underserved prisons in the Central Valley. Fresno State and UC Merced were approached to help staff new programs in Avenal State Prison and Central California Women's Facility in Chowchilla. After attending an informational meeting and learning about the program, Calliope and several Fresno State faculty and students signed up. The program is centered around inner growth, learning about ecosystems and the environment, while gaining vocational skills. The end result is an actual garden, a spot of beauty and peace. Having flowers and plants inside the prison not only affects the participants in the program but is enjoyed by others inside the prison. Calliope loves connecting people to the magic of the natural world. "Something as simple as touching a flower or smelling a basil leaf can be a peaceful, even spiritual, moment for someone who has been inside for many years," said Calliope. Fresno State has established several positive relationships between colleges and with participants inside the prison. "For me, IGP represents a catalyst for rehabilitation and for personal growth for those currently residing inside the prison," said Calliope. Dr. Monica Summers, a professor in the Criminology Department, and Arnold Trevino, a social work graduate student/Project Rebound student, are also involved with IGP and visit on a regular basis. "I feel that volunteering for IGP enriches my skills as an educator and scholar," said Monica. "As an educator, I can share my experiences with my students, providing a richer explanation for the benefits of rehabilitative prison programming. As a correctional scholar, consistently visiting Avenal State Prison promotes research ideas for improving correctional practices and reducing recidivism. Finally, most importantly, I learn a great deal through the curriculum and interactions with the inmates and program facilitators. Seeing the transformation of the men in the program has been immensely rewarding, and I am grateful for the opportunity to be a part of it." Students find the experience rewarding as well. Arnold noted that the program helps them come out of their comfort zone and overcome personal limitations. 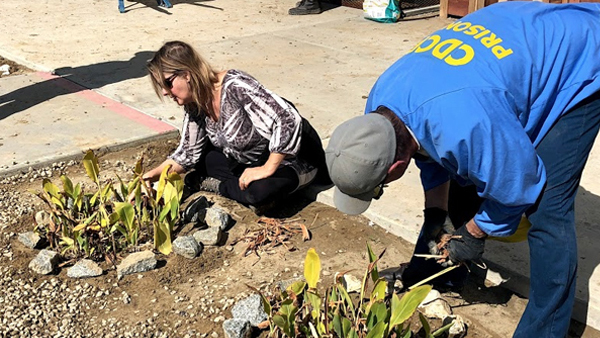 "This program has taught its students that we can come together and live pro-socially in a diverse community as we have learned in working together while installing the garden with a diverse group of students," said Arnold. "We could not have done this working alone. The program also teaches the importance of permaculture, how we can live with our environment and not against it, much the same way we can live with our neighbors and not against them. The program works its magic in its own mysterious ways to help where help is needed. We are witness to this transformation, and know first-hand the importance of programs such as IGP within the prison system." Jennifer Leahy, adjunct lecturer in the Criminology Department, also volunteers for IGP. As director for Project Rebound at Fresno State, she has seen the transformative power of serving a community. Project Rebound, a program that supports formerly incarcerated individuals in their pathways as Fresno State students, is in partnership with IGP, allowing Project Rebound students to go back in to the prison community and see the world they live in through a different lens. "This awareness transforms them into a state of conscientiousness that was lacking in many of their lives before," Jennifer said. "It teaches an in-depth understanding on both a micro and macro level of the natural world and the significant part each of us plays in that world. This develops a sense of personal responsibility for the community for each student." IGP is just one of the amazing collaborations between the University and Avenal State Prison. Recently, the exhibition “Insider Art: Exploring the Arts within Prison Environments” opened at Fresno State’s Graduate Art Studios to showcase over 100 pieces of paintings, drawings, sculpture and small pieces of craftwork by incarcerated men at Avenal State Prison. "Hope is a powerful tool when redesigning one's future," said Jennifer.